Commensal Coral Hermit Crabs are tiny, sessile hermit crabs that live inside corallites or in holes left in the coral by Polychaete worms like Christmas Tree Worms Spirobranchus sp. 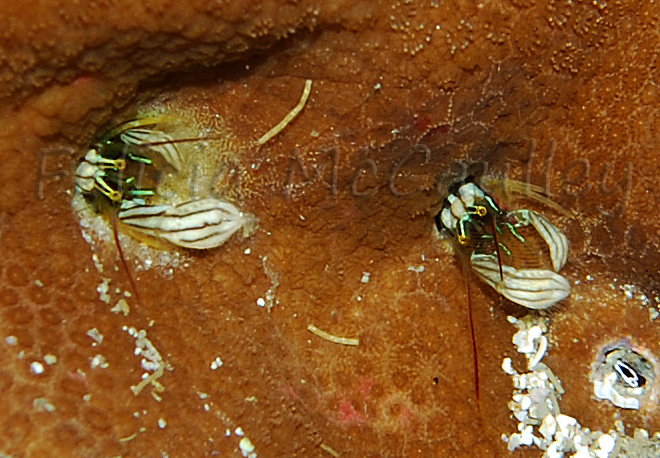 Coral Hermit Crabs host in a number of different stony corals such as Porites spp., Astreopora spp., Leptastrea spp., Montipora spp., Cyphastrea spp., and Faviid brain corals. Mated pairs live within inches of each other. They are able to use their legs to move around inside or retract into the hole, but never leave it. Like their larger cousins, they have claws which can be used to tear apart and consume larger pieces of food, but also have feathery antennae they use to capture small bits of passing plankton. Coral Hermit Crabs are right-handed; the right cheliped is larger than the left. The color and patterns on the claws vary depending on species, but is usually yellow or tan. 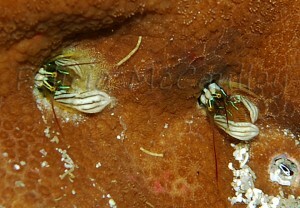 In an aquarium Coral Hermit Crabs should be target fed small meaty pieces of food like frozen small mysis and Cyclop Eeze. Weekly feedings of micro foods like frozen rotifers and other foods designed for filter feeding invertebrates. 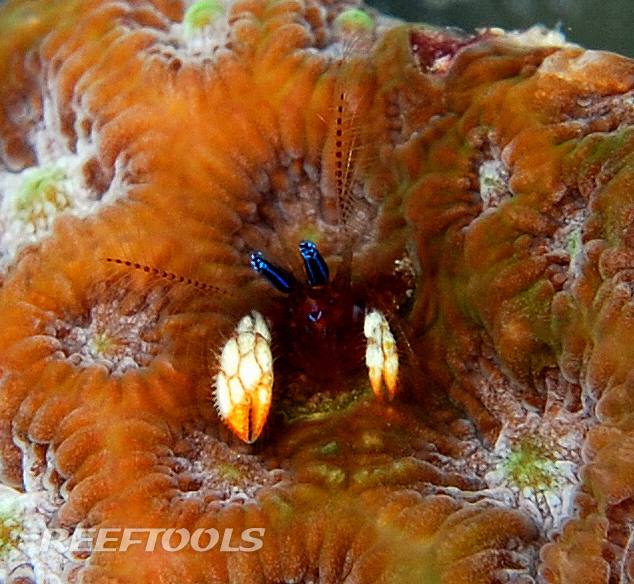 Coral Hermit Crabs are peaceful and pose no risk to any other tank mates or their coral hosts. Do not house them with aggressive tank mates or those that eat small crustaceans. Like other invertebrates, Coral Hermit Crabs are sensitive to changes in water quality, nitrates, and copper.